Update (24.04.2013): Please note that the event is already fully booked so that we are currently not in the position to accept any further registrations. If you wish to join the waiting list for seats that may become available please fill out the online application form for the waiting list below. We will notify you as soon as possible if a seat should become available for you. Thank you for your understanding! 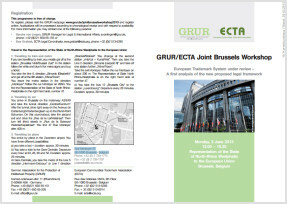 In its 5th edition of the GRUR meets Brussels Workshop series, the German Association for the Protection of Intellectual Property (GRUR) has joined forces with the European Communities Trade Mark Association (ECTA) to organise a GRUR-ECTA Joint Brussels Workshop entitled "European Trade Mark System under review – A first summary of the new legal framework". This joint event consisting of two high level panels will provide a comprehensive roundup of the new package of legislative proposals presented by the European Commission on 27 March 2013. In a first panel, the MPI, National Trade Mark Offices and key EU legislators will offer their insights of the new EU legal framework proposed by the Commission. The second panel will bring key representatives of OHIM, National Trade mark Officers and users together to discuss the new challenges and perspectives in the context of a peaceful coexistence of the EU and national trade mark systems. The workshop will take place on Monday, 3 June 2013 from noon to 6.30 p.m. at the Representation of the State of North-Rhine Westphalia to the European Union in Brussels and will be followed by a reception. GRUR and ECTA are pleased to invite their members and interested circles to this joint event. Please already save the date in your agenda. To view the complete programme or register online please check the links below. Please note that applications will be processed according to chronological receipt and with respect to availability. The Joint Workshop took place on 3 June 2013 in Brussels and was attended by over 130 participants. A list of attendees, a photo gallery and some of the presentations can be found below by clicking on the tabs “Dowloads” and “Picture galleries”. A list of all speakers of the joint workshop can be viewed on ECTA´s website. If you would like to follow-up on the ongoing reform, you may consider participating our GRUR Annual Meeting 2013 taking place from 25 to 28 September 2013 in Erfurt where one a special forum on trade mark law will focus on “The competition of trade mark systems – chances and risks of the Commission’s amendment proposals (TMD and CTMR)”. Online registration.